Shoot, slice and surf on zombies by yourself or with friends. Fight overwhelming amounts of zombies and other monsters summoned by an evil wizard (ooOooOOOo spooky) in an early 1900s London. Very Positive (291) - 83% of the 291 user reviews for this game are positive. It's Xmas time in GIBZ again! Everything from previous years is back, a couple of hat buff changes were made and a rare upgrade has been added to the Travelling Merchant. Buy the "Dynamite Pouch Expander" to permanently be able to hold a total of 9 sticks of dynamite (12 with the Mining Helmet buff). The chances of it being in-stock is greatly increased during the Xmas event, so make sure to get it if you like to throw dynamite around. Find a zombie that's getting into the holiday spirit. Then kill him and take his hat. Can you find the legendary Deerwolf and claim it's antlers? I also did some more work on the texture loading to try and help the people who've been getting LoadingFailedException crashes. Let me know if this update causes any problems for you, though hopefully it should work better for everyone. The support and option for High Resolution Sprites/Textures (4K) has been added to the game! Great for people that play the game at a 1440p resolution or higher. Originally the game used sprites/textures made for 1080p, which didn't look that good when you played the game at higher resolutions. So I went through a re-exported them all for 4K, added support for sprites at different resolutions and fixed a whole bunch of problems that came with it. Now the game can look nice and crisp at higher resolutions! New Activity: Base Defence added! Build and defend your base from waves of enemies and bosses! New special primary weapon and hat to unlock! 10 new Achievements and 2 new Leaderboards to compete in! Mini-games: Mini-games appear on the overworld map. 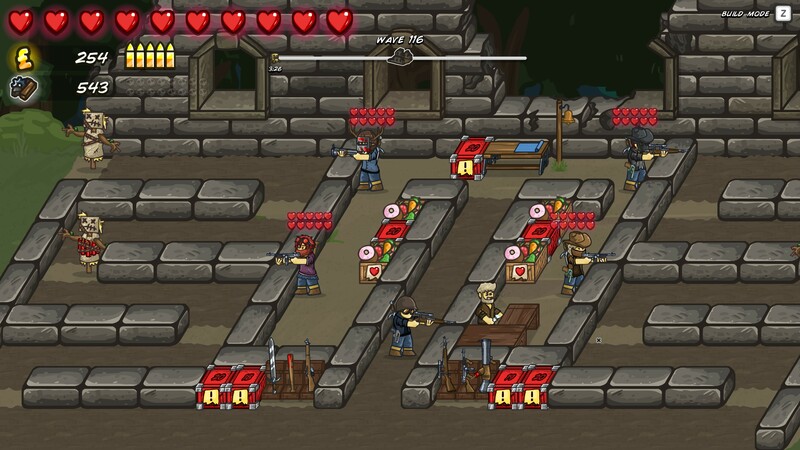 Try Zombie Surfing, Gatling Gun Defence, Treasure Digging or Mayhem!